High Mercury Levels Found In Women In Lower-Income Countries : Goats and Soda A study looked at women in 25 countries and found that many of them have elevated levels of mercury, likely due to human-caused pollution. A public health worker in Nepal takes a sample of hair for mercury analysis. Most people have had some exposure to mercury. Fish is one source. So are mercury vapors from workplaces and factories. That's what the World Health Organization and the Centers for Disease Control and Prevention say. But higher levels can cause damage to the kidney, lungs and neurological systems. And for women of childbearing age there's a severe additional risk: mercury levels that exceed the Environmental Protection Agency's "reference dose" — the level of daily exposure that the EPA says is unlikely to negatively affect people's health — could damage the fetus that a pregnant woman is carrying, including its kidneys, cardiovascular system and IQ. And how many women are potentially at risk? That was the question behind a new report: "Mercury in Women of Childbearing Age in 25 Countries," from IPEN, a nonprofit devoted to issues of global health and toxic chemicals, and Biodiversity Research Institute, an ecology research organization. 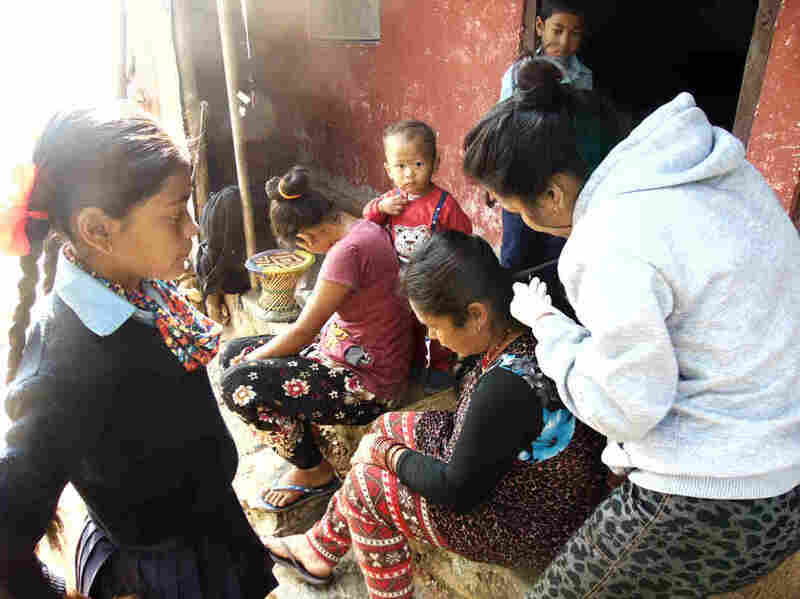 The groups studied 1,044 women from lower-income countries and found that 42 percent had average mercury levels exceeding the EPA reference dose in their hair samples. It's likely that human-caused pollution is to blame for these elevated mercury levels. Women from small-scale gold mining communities had some of the highest rates of mercury in their hair samples. In Indonesia, Kenya and Myanmar more than half of the sampled women from these mining communities exceeded the limit. These operations often extract gold from ores by heating up an alloy containing mercury, creating mercury vapor that can be inhaled. According to researcher Lee Bell, lead author of the IPEN paper, this can put workers at risk and contaminate local waterways. Diet is another factor. In the Pacific Islands, 86 percent of the women tested had higher levels of mercury in their bodies than the EPA standard. Bell says that in this part of the world, coal-fired power plants and other industrial sources of mercury pollution are likely to blame. It ends up in fish — a staple in the diet of many Pacific Islanders. The study also looked at an indigenous community on an Alaskan island whose diet is high in sea mammals like walrus and seal. The report found 30 percent of the Alaskan women, who are part of the Yupik indigenous group, exceeded the EPA mercury threshold. Imogen Ingram is a member of the IPEN Steering Committee and a resident of Cook Islands, one of the places in the South Pacific included in the study. Ingram had her own hair tested while attending an early negotiating committee for the Minamata Convention of Mercury, a worldwide agreement through the U.N. that aims to address the global mercury issue with measures like lowering mercury emissions and better regulating small-scale gold mining. She found that her level of mercury was 2.5 times higher than the EPA threshold. "I'm glad that I lived to my age without any apparent effects ... I had my son and he had no apparent brain damage either," she says. "But, you do worry about other people. Especially if you're not aware of it." After she was tested, she later helped collect hair samples of Pacific Island women as part of the IPEN study. Conventional advice recommends limiting fish consumption, says Ingram, but for communities on small atolls like hers that rely on seafood, that's not always an option. Instead of telling people to stop eating fish, she would rather work to clean up the ocean to make fish safer to eat. Pamela Miller, co-chair of IPEN who was involved in organizing sample collection in Alaska, says that the marine mammals and fish that are likely contaminated have been in the Alaskan indigenous people's traditional diet for centuries. When it comes to alternatives in rural Alaskan villages, she says, many are cost prohibitive — importing food can be expensive. Mercury pollution is not a new issue. But in the past 100 years, says Bell, industrial development has boosted levels. According to a 2014 study published in Nature, humans have tripled the amount of mercury in the upper 100 meters of the ocean since the start of the Industrial Revolution. And mercury doesn't stay put. Bill Pan, assistant professor of global environmental health at Duke University, says "the problem with the atmospheric release of mercury is that you could have a gold mining operation in Peru or South Asia but it transports over long distances. And when I mean long distances I mean thousands of miles." Because the problem now reaches across continents, Miller underscores the importance of global cooperation. "This is a problem that can't be solved by one location. Mercury is something that's transported across international boundaries," she says. Bell says that the international community has recognized the issue with the Minamata Convention. The convention's first major meeting took place last month in Geneva, Switzerland. So far, the agreement has 128 signatures.